Help the Edible Schoolyard at Hunters Point be the healthiest place for youth in San Francisco! The Edible Schoolyard at Hunters Point, established in 2008, is an organic teaching garden and kitchen program at The Willie Mays Boys & Girls Club. It is the first afterschool program in the country to become a founding affiliate of The Edible Schoolyard Project, which started in Berkeley by Alice Waters. 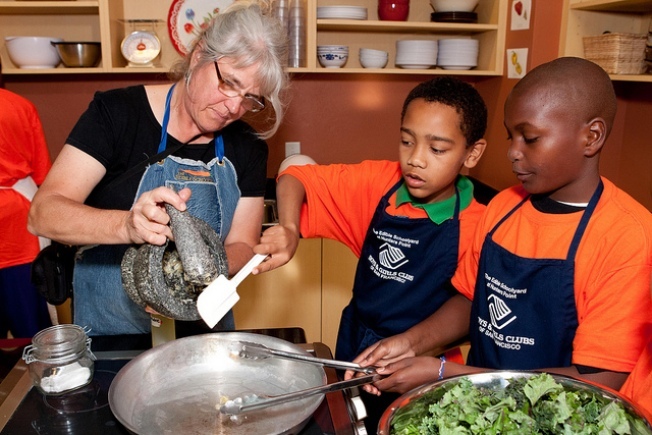 The main objective of this program is to involve Club members and their families in all aspects of tending the garden along with preparing, serving and eating the food as a way to increase access to fresh fruits and vegetables and develop lifelong healthy eating habits. Join SFPDV.com, a select group of San Francisco's premiere restaurants & private event spaces, for a festive evening of amazing food & wine, specialty cocktails, live music, raffles, live & silent auctions to benefit the Edible Schoolyard at Hunters Point. The event will be emcee'd by the Bay Area's food enthusiast Liam Mayclem & showcase sfpdv.com's celebrity chefs, owners and mixologists. Cost: $65 for individuals and $120 for a pair. Donations of any cost are welcomed if unable to attend. Parking: Validated Parking Available on-site at the Ghiradelli Square Garage. The entrance is on Beach Street between Larkin & Polk Streets. Validation is for 90 minutes of parking for $2.50. After 90 minutes the rate is $2.50 for each additional 20 minutes.